Maidstone & Mid-Kent Motor Club (M&MKMC) magazine from 1954. Homepage. This page: A look at the club's well-turned-out magazine, as it was in 1954. "Kent Driver" by the Maidstone & Mid-Kent Motor Club. Representing the South East corner of our fair isle in this look back at motoring magazines from years gone by, is this, "Kent Driver", the official publication of the Maidstone & Mid-Kent Motor Club. This copy dates to April 1954. 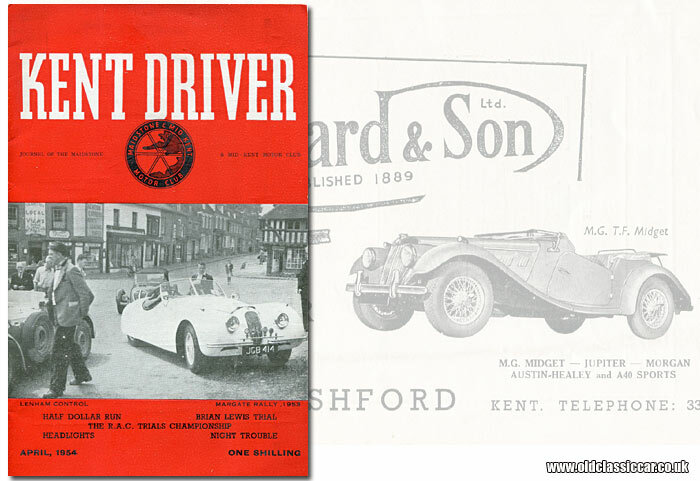 While the club itself was founded many years earlier - 1935 to be precise - it wasn't until 1953 that the first club magazine was produced for its membership, named "Kent Driver". For a club with, at the time, a couple of hundred or so members, the quality of the publication is surprisingly high. On the cover is a photograph of white alloy-bodied Jaguar XK120 OTS (Open Two Seater), registration JGB 414, with, alongside it, an open-top Allard. Can anyone identify the car behind the 1951 XK? The event was the Margate Rally of 1953, at (we're told) the Lenham Control point. Unfortunately as this event had taken place some months earlier, the write-up isn't contained within this issue - so identifying the cars and their owners, might take a little more digging. The DVLA site confirms that the Jaguar is not only still in existence, but currently taxed also. The chassis number is recorded elsewhere as 660682, XK 3.4 litre engine number W2922-7. Evidently the club was well respected in the locality, judging by the number of car-related businesses that advertise within its 24 pages. 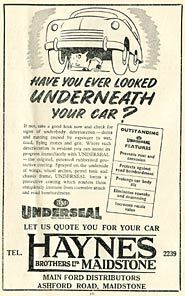 The outer rear cover for instance features a full-page advertisement for C. Hayward & Son Ltd, a sports-car dealer located at 20-46 New Street, Ashford, in Kent. Illustrated is a brand new MG TF "Midget" two-seater. In addition to MGs, the same dealer could also supply Sir or Madam with a Jowett Jupiter, a Morgan, one of the recently-introduced Austin-Healeys (at the time the 100 BN1 was current), or the Austin A40 Sports model, powered - if you can call it that - by the Somerset's 1200cc engine, albeit with twin (rather than single) carburettors. Many of the articles revolve around competitive meetings that the members had enjoyed, which were in the main trials and road rallies. The Editorial though, rather than concentrating on official club activities, recalls an entertaining late-night dice that the Editor and his passengers, comfortably accommodated by the leather armchairs of a Humber Snipe (era not quoted), had with a fellow member of Margate Motor Club, the latter piloting - with some verve - a Ford Consul. The first that the Humber driver knew of the presence of the Consul was when it howled past, "with a scream of tortured rubber he was round the bends of the bridges and away". Sensing the opportunity for a spirited encounter, the Humber pilot changed down to third and set off in hot pursuit of the Dagenham-built machine. He caught and passed the Consul at a (for the time) heady rate of knots. The fun continued it seems for a number of miles, the Ford described as leaving four black marks at times on the road. On the face of it to readers now this might seem like the act of hooligans, but the speeds quoted in the Editorial are broadly in line with limits of the time, and it wouldn't take much effort to leave rubber marks on the road with a lumbering "Five Star" Ford shod with crossply tyres. It acts as a reminder that entertaining drives in older cars, needn't involve the three-digit speeds that having fun in modern cars usually require. Chances are they were also driving with more attention and awareness of the conditions than many do today, as they charge about, cocooned in their whisper-quiet cars, the drivers alternating their attention between the road, their choice of MP3 selection, and the intricacies of their car's climate, or possibly its navigational, equipment. Opposite the Editorial is a full-page advertisement for the Rootes garage in Maidstone, at the time enticing potential customers into their showrooms with the Sunbeam Alpine - "winner of four Coupes des Dames in the first Alpine Trial", the Sunbeam-Talbot saloon, and the Sunbeam-Talbot Convertible. The Club Secretary takes the opportunity to remind members that the annual subscription, £1, would be due on 1st April, and then goes on to discuss some upcoming events. These include a race meeting at Silverstone in May, and the Margate Rally. As the year was in full swing, it was possible to provide updates on some of the meetings that had gone before. The "Half Dollar" Sunday Rally was deemed to have been a great success, designed with "ordinary" club members in mind, rather than the die-hard competitors that might usually have been found on such a road event. The route took the teams along fifty miles of road, the navigators juggling directions and maps, while the drivers concentrated on the road ahead, mindful of road rollers, cyclists, horses and other such devices that can often be encountered unexpectedly on rural routes. Playing around in mud is something that starts from a young age, and many's the enthusiastic motorist who never truly shakes off their enjoyment of the brown stuff. To these individuals the delights of off-road trialling were designed, and events such as the Brian Lewis Trophy Trial were the perfect excuse to spend the day getting covered in mud, while driving a trials car up a winding, muddy off-road course. Various awards were presented at the culmination of the day, with cars such as Cotton III, Cannon, Deeford, Dellow, Lotus, Chandler and Spence all getting a mention. A return to night road rallies then arrives on page twelve, the author recalling the last-minute preparations that he and his navigator had to undertake, prior to competing in a standard 1931 3-litre Lagonda saloon, which he himself admits might not have been the best choice for barrelling down an unlit narrow lane, at some obscure time of the night. The list of forthcoming events pencilled in for the remainder of 1954 would certainly make the £1 annual membership subscription seem like a worthwhile investment. In addition to trials and road rallies, there is also a sprint meeting to be held at Brands Hatch, an autocross meet sometime in July, and the Coronation Rally (organised by the Cemian Motor Club), to name just a few events, before the delights of the annual dinner and dance, which was due to take place in November. 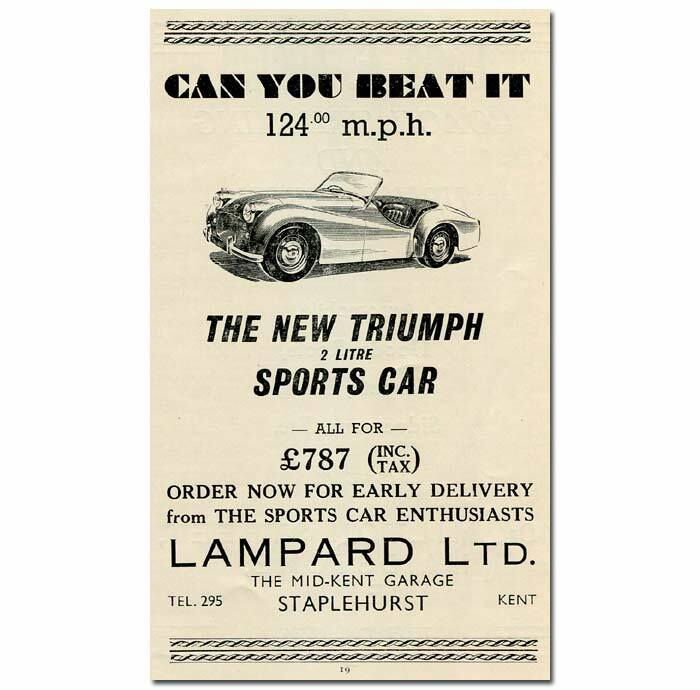 Advert for the new 2-litre Triumph sports car (TR2), on sale for £787 in the showroom of Lampard Ltd, located at the Mid-Kent Garage, Staplehurst. Return to the car magazines section, to read about other motoring titles.